Great car and nice read! I've been meaning to do the North Coast 500, it looks amazing. Cheers Grease monkey!. I'd thoroughly recommend it. The roads are just perfect for Minis. If you end up doing it give me a shout and I could meet you for a day of driving up this way! Yes single circuit will be fine for disc & drum. Over here in Australia we use 5/8 rear wheel cylinders when doing so. Great car, I really like the paint! 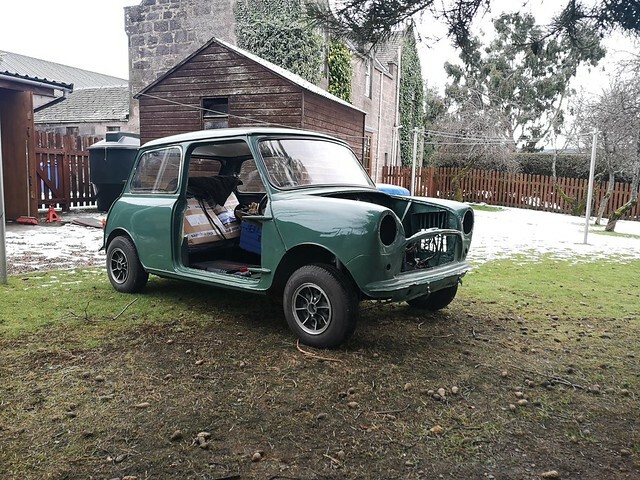 That would be really cool, how long do you recommend someone should set aside to do the whole drive in a mini say? Can it be done in a week? Thanks for the tips and the kind words. 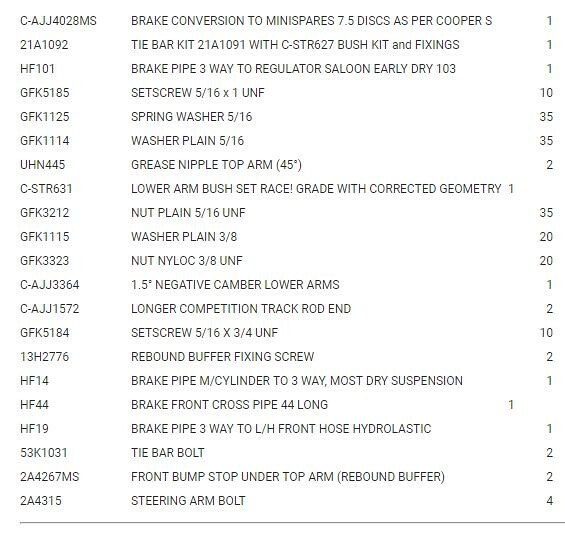 Parts ordered for the drum to disc conversion, and new lines too. The conversion kit was out of stock on Minispares but i've got it on back order now. Can't wait! Not sure where you are coming from, but easily doable in a week. I think it took me 4 nights, from Inverness, round to Ullapool and then back to Inverness. There's nowhere you need to stay more than a night, and in all honesty you could physically drive the whole thing in 2 days - but of course theres loads of places you want to stop, it's just beautiful. If you could do it before the summer season then it would be great, a bit more freedom on the roads. If you're serious send me a message and i can point out some off the beaten track spots to go to, and recommend places to stay or camp along the way. Lets try to make this thread look a little better and put some effort into it. My previous updates have been a bit half arsed. 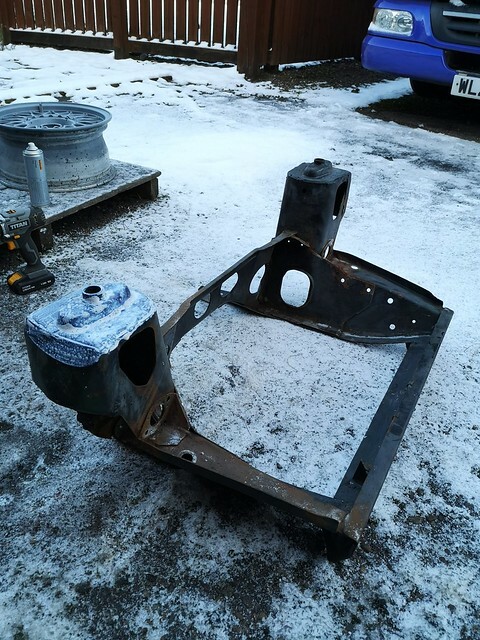 So, this week i managed to order the remaining parts to build the front subframe. 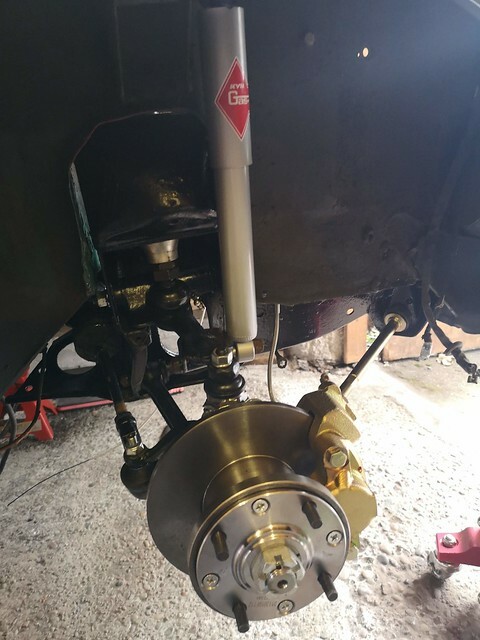 Primarily the drum to disc conversion kit from Minispares, i've also opted for 1.5° neg camber arms with their respective offset bushes. I've also gone for the adjustable tie bars from Minispares. The 1.5° arms will be an experiment, once the car is back running on the road i'll be testing geo settings, but i want to use this as a starting point. Most of the fixings etc required for the build are in there too. I'll need to strip the rear subframe back down and fit spring washers where required as i didn't have these prior to the car getting painted. 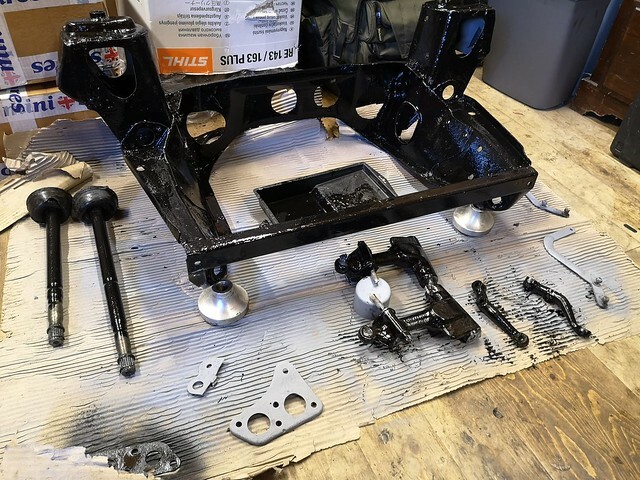 Finish stripping and cleaning the front subframe. 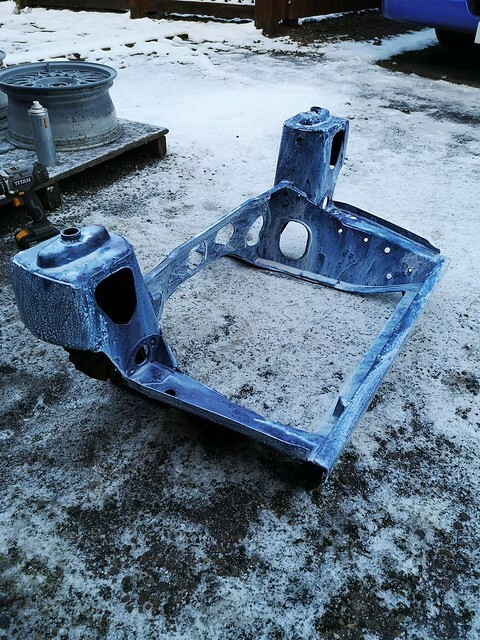 Coat, prime and paint the front subframe. Finish cleaning bulkead, seam seal and prime bulkead and engine bay. 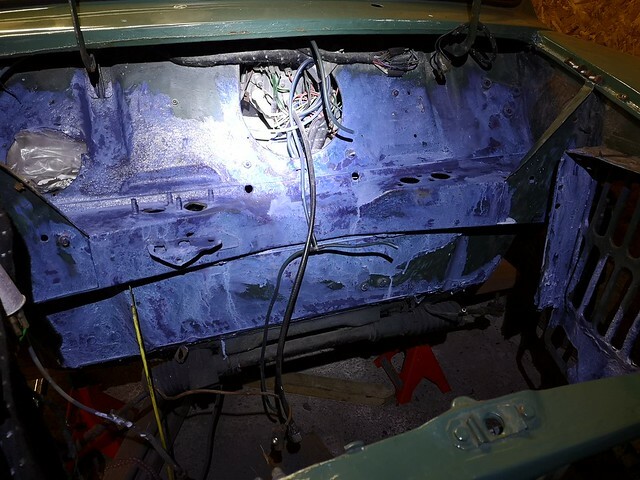 Have a can of Almond Green paint put together for the engine bay. 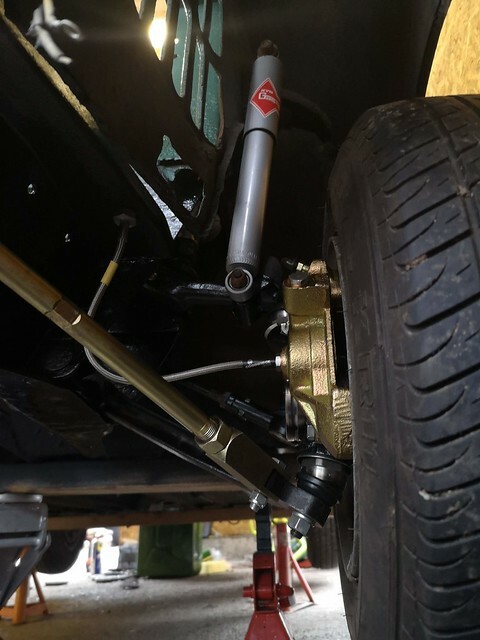 If time allows fit the new brake lines on the front subframe. Good to see your on the ball with this resto. I am in Aberdeen if need any bits I have.. also if your passing and need some motivation. Well that was a cold, damp and frosty weekend.. Not ideal for painting things, but i cracked on regardless. 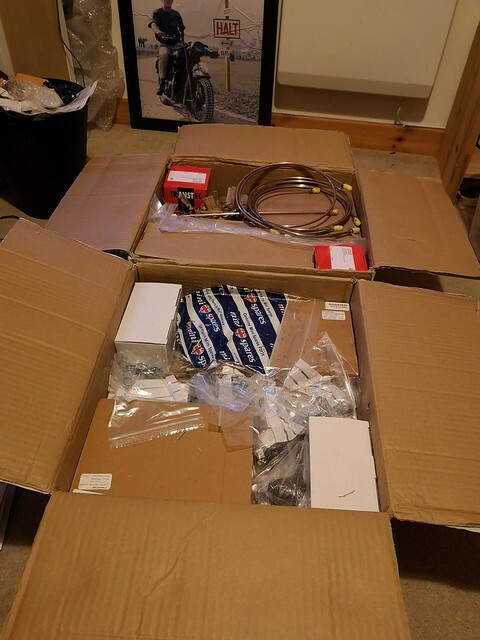 Friday a box of bits turned up (see last post for the list) - safe to say another brilliant service from Minispares, ordered on Wednesday thinking the disc conversion was out of stock, but they must have just received their stock and it all turned up on Friday! Not much in this box will be getting used this weekend, but it's still nice to have it. So on the grand scale of things it doesn't look like i got very much done. 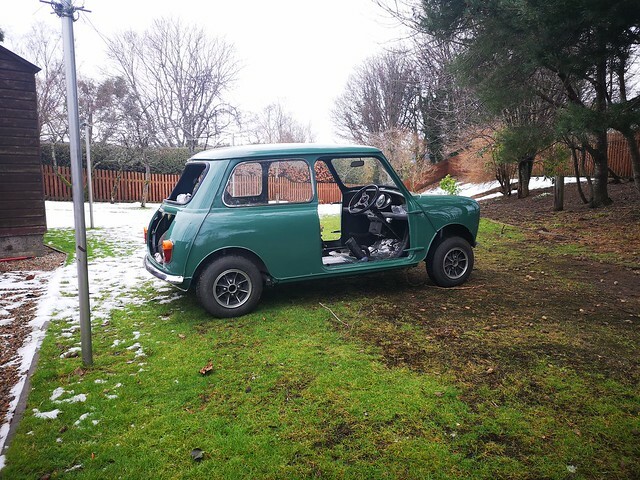 However i had a lack of Almond Green paint so it wasn't possible to start painting things with that, and in all honesty it was so cold that everything was taking HOURS to dry. 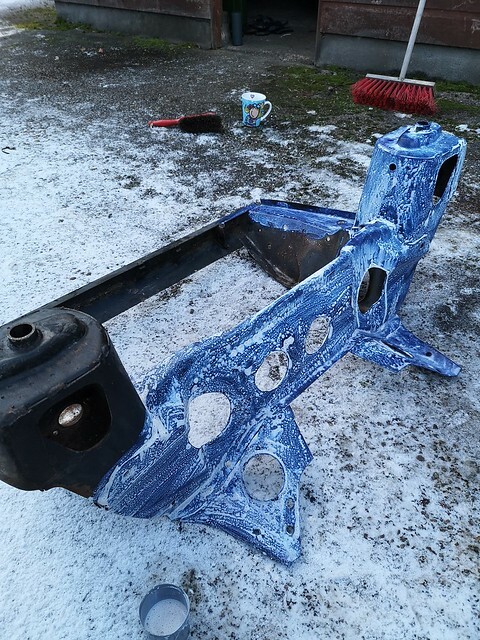 I've only managed to put one coat of paint on the subframe, but it'll be dry by the time i next get to work on the car and it should only need one more coat. 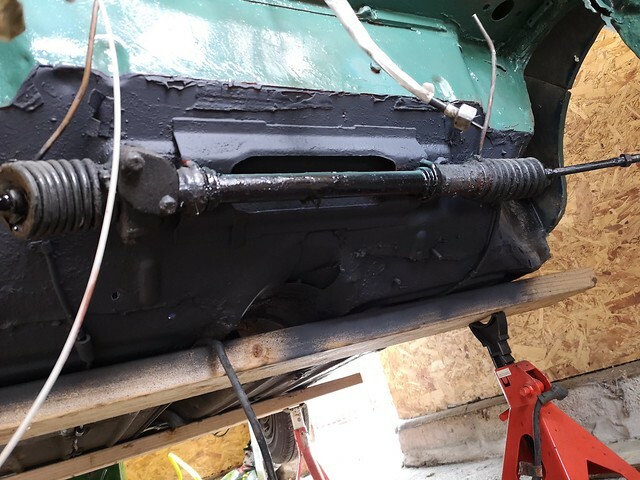 Then it was on to the subframe itself, the same thing - clean, Kurust and prime. It's worth noting that for this stuff i'm using an etch primer as some of it was down to bare metal. Working in the snow is not ideal!!! 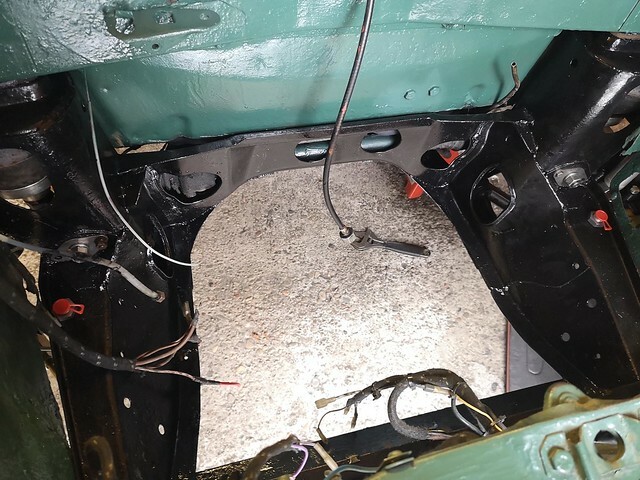 I managed to crack on with the engine bay also, i got the gasket plate for the heater matrix hoses off and the wiper motor. Gave it all a good rub down with a wire wheel, then chucked on some Kurust to seal it. 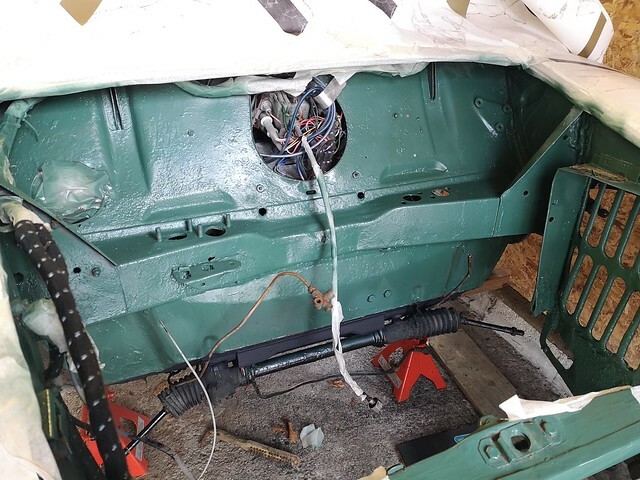 I wire wheeled right down to the transmission tunnel behind the steering rack, so it was primed and sealed all the way back there for now. 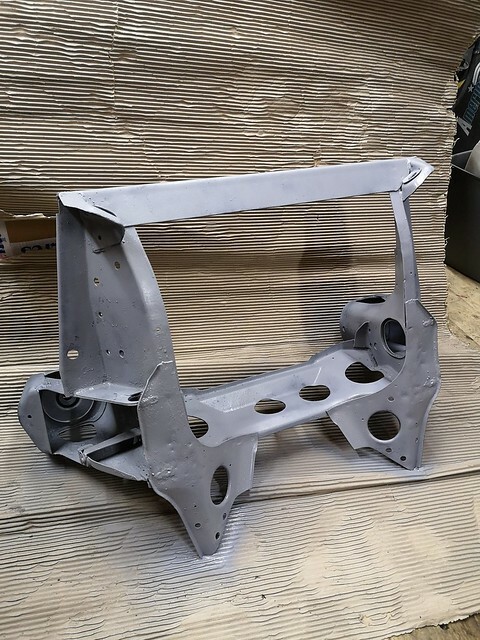 For priming it i used red oxide primer as i want as much protection as possible and i'm not too fussed about finish here - it wont be a concors car! So that was the major items i managed to complete this weekend. 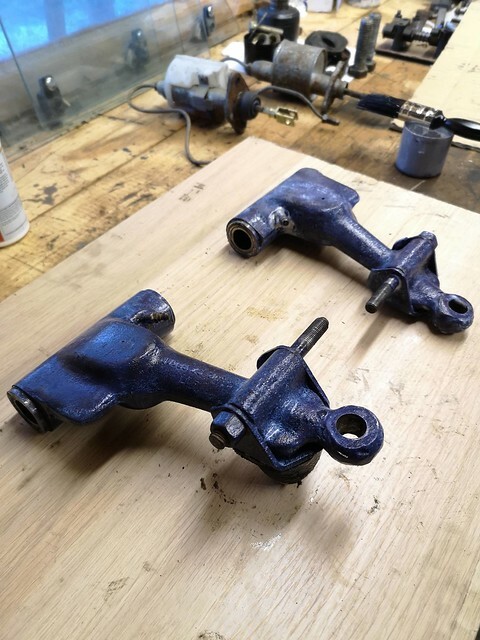 There were other little items too, such as getting the drive shafts and the steering arms off the old brake setup - cleaning and painting these items while i was at it. These now ready to be fitted to the new brake setup when the time comes. As i live an hour away from where the car is stored - yes not ideal!! I decided to bring the new brake kit back with me. Hoping i can build up the complete hub units at home one evening this week - that would certainly speed up the process for the next weekend i get to work on the car. 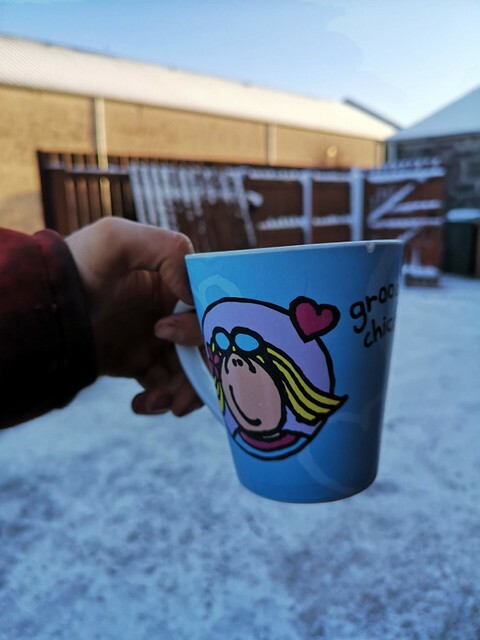 Am i a mug for working in these temperatures and snow?!?! 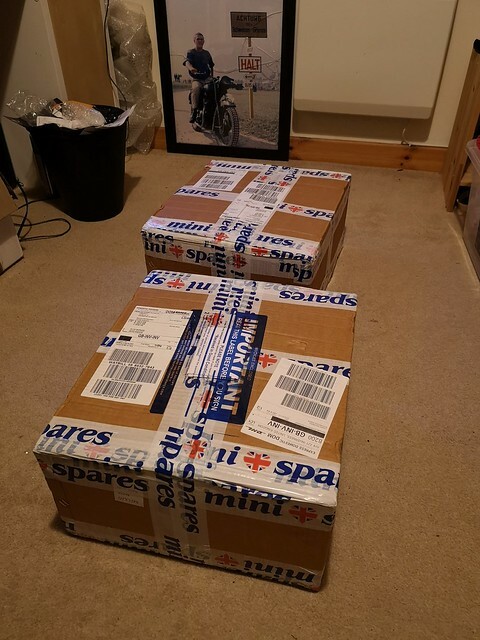 Maybe i'm a groovy chick..
Looks like Christmas has arrived from Minispares ! Enjoying seeing the progress on this one. Another update! This one feels good, i think i'd class it as a good milestone for the project. 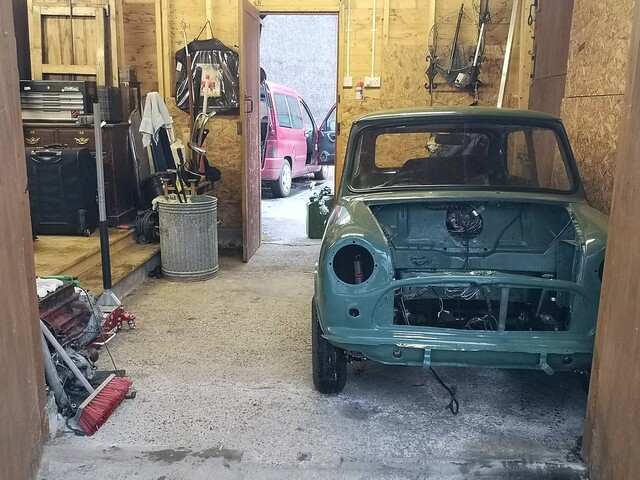 The goal this time was to get the car on all fours again, Saturdays task was selling another member of the fleet a Mk1 MX5 - that sold successfully and I had booked off Monday and Tuesday this week so i could get 3 solid days work in. 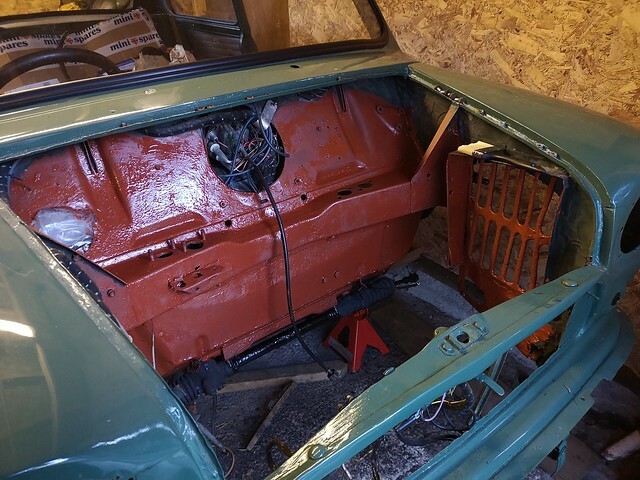 When i left off in my last update I was refurbishing the front subframe, top arms and the engine bay. I started with finishing off the upper arms. This seemed easy at first, until I realised, I didn’t have a blind bearing puller. No problem I thought, I'll just nip to the local trade centre and get one. 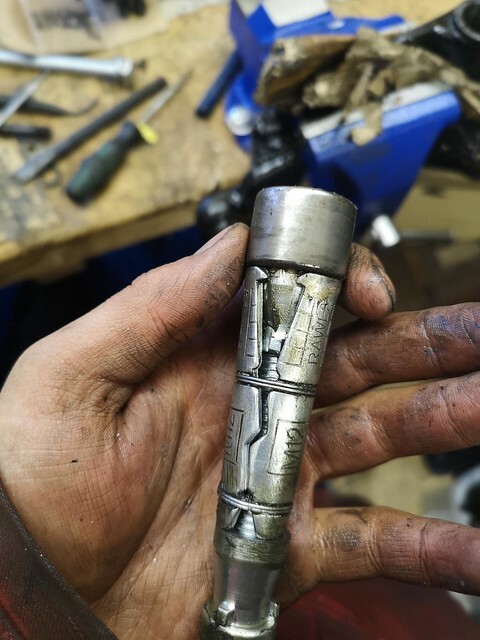 Then I realised I'm based in the Highlands and they wouldn’t have one, well apart from the £200+ bearing puller sets that I don’t need (but do want...). 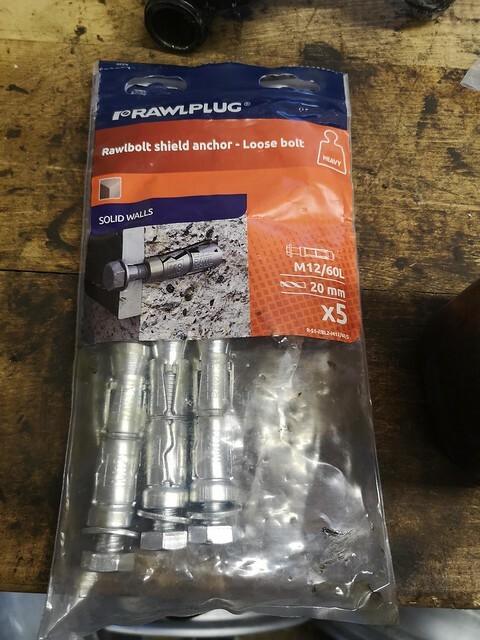 My solution which was loosely inspired by an article I read online after far too long googling solutions was to get some concrete expanding “Rawbolts”. I’d made a bit of a mess of one bearing by trying to “drift” it out, so I left that one until last. 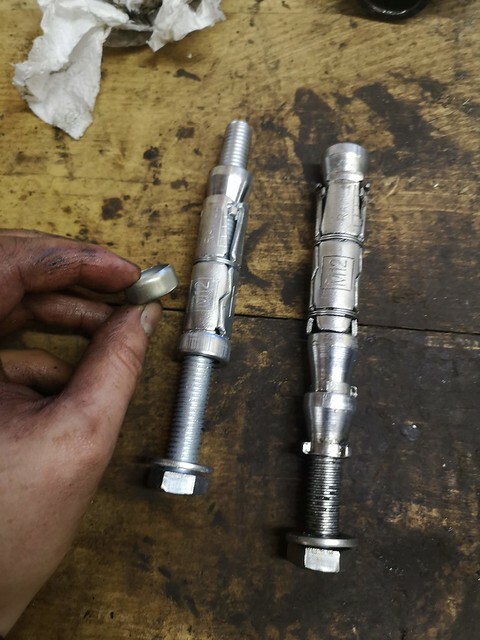 A bit of modification required to get them to work, combining two of the Rawbolts into one. But all three of the others came out without a hitch! Very happy with the way it turned out. Once out I cleaned them all up, refitted the new bearings and that was them good to go. 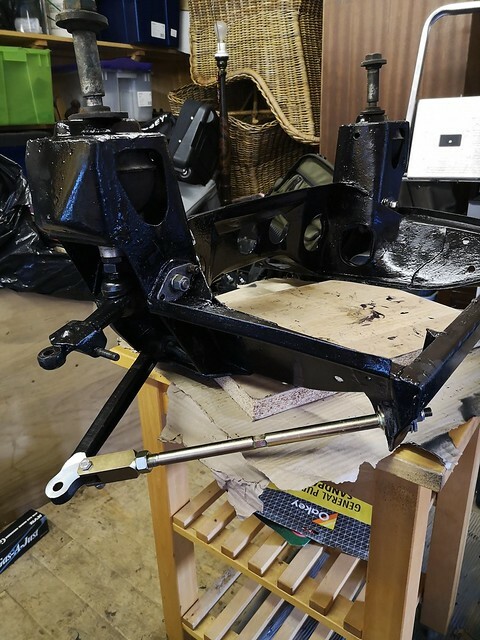 After this I started assembling the subframe with the refurbished top arms, the adjustable tie bars and the 1.5° negative camber lower arms. 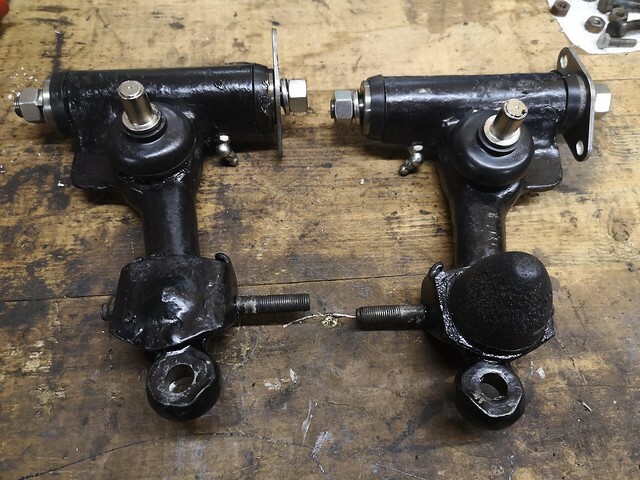 I fitted the lower arms with the correct offset bushes as per Minispares recommendations. 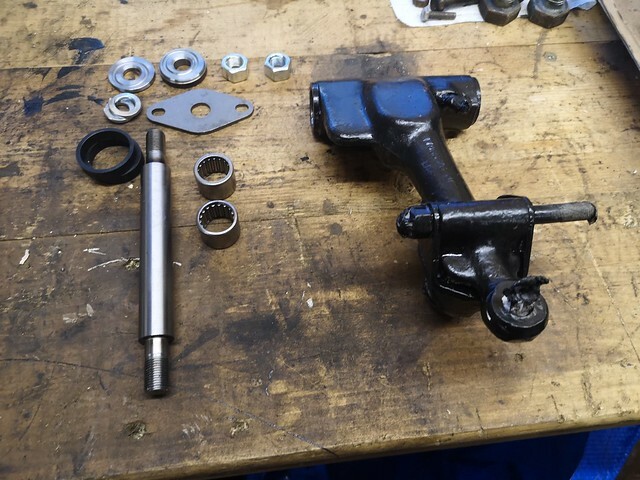 Next up it was on to the new front hubs and brake assembly for the 7.5” Cooper S conversion! 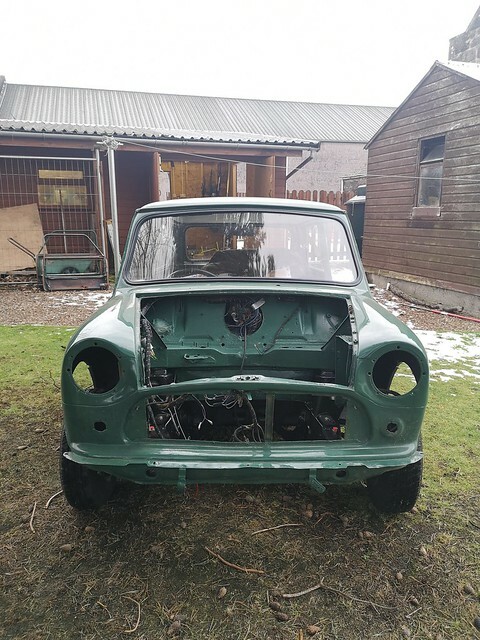 Very exciting stuff, and the same kit I fitted to my old 94’ sprite – except last time I did it I had help from my dad, this time It was on my own. All went smoothly, took me a while to make sure I was happy with the bearings etc. 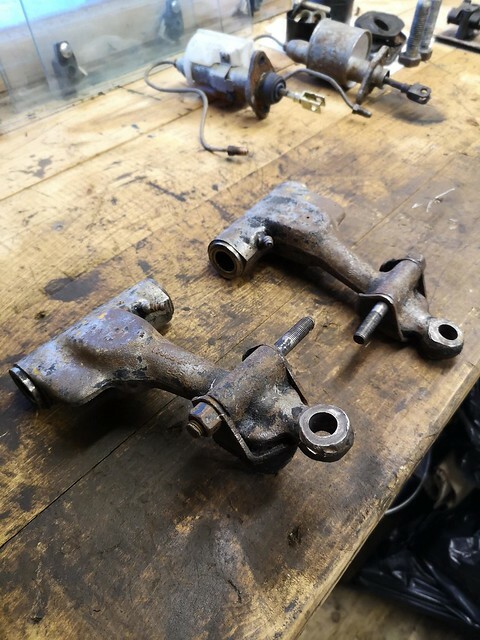 Once assembled I left these off the subframe as it was easier for me to fit these once the subframe was in due to the weight of the assembly. Now just before I fitted all of this into the shell I wanted to paint the bulkhead and the engine bay. I had a 400ml tin sent from Martin Brown Paint’s which cost a small fortune and it was JUST enough to do everything I wanted. While I was at it I chucked some stone chip paint on the lower bulkhead for good measure. 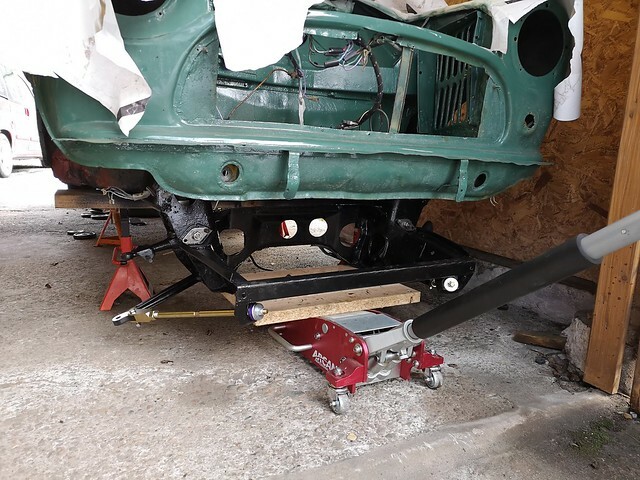 Once everything was dry it was time to get the subframe bolted up and the brakes on, everything is looking great and i can't wait to drive it. 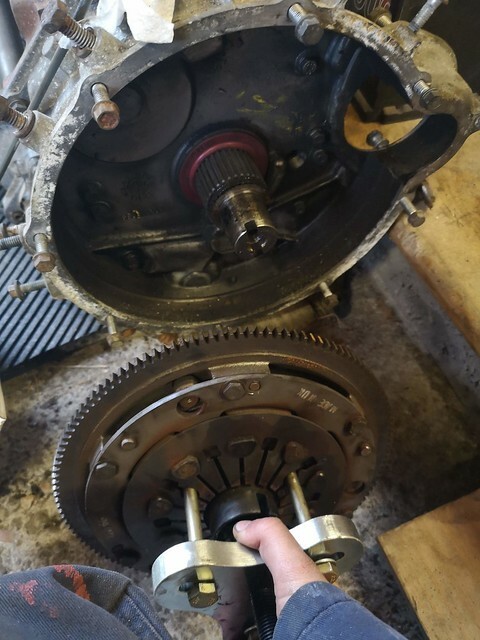 One last thing while i had the liberty of doing so; Andy let me borrow his flywheel puller so i managed to get that off too. In my naivety i left the key'd washer in while using the flywheel puller and cranked everything up as tight as it could go, once i realised i hadn't removed this it popped off without too much trouble. A couple of days of good work. Very nice thread and nice rebuilt ! But I ask a question / remark. Your car is from 1965, so MK1. Shouldn't it have solid mounted front frame with double bolts? ans maybe hydrolastic suspension? 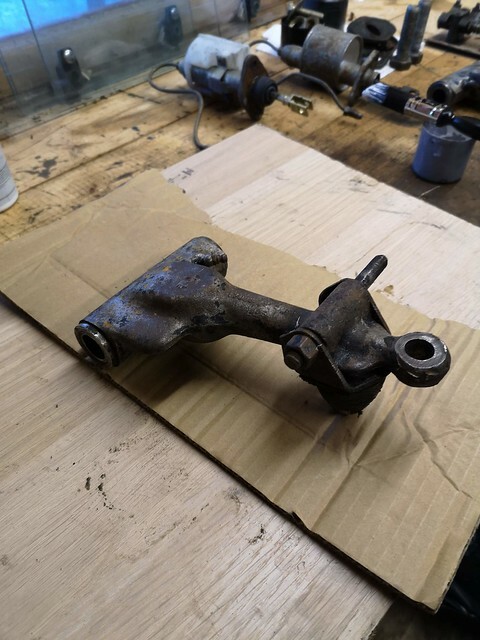 It looks to me to be a later (MK4) frame with the single big bolt and rubber mounts ? 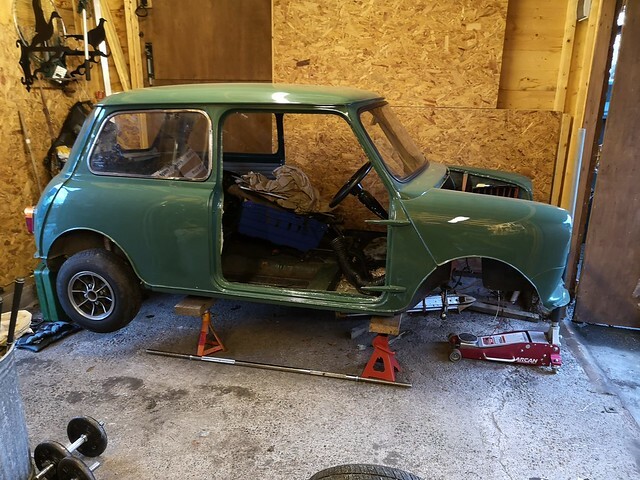 Yes the previous owner has replaced the front subframe at some stage, there are still the mounting holes for a twin bolt subframe and in a perfect world I would have purchased an original but sadly that is out of budget so I'm just going with what I have. The shell is certainly a Mk1. Alright, I now understand better ! !